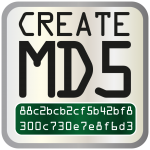 For the avalaible downloads here like Sfott, I now make an MD5 checksum. But I find it really boring to do it once or two or… and then have to select then copy the resulting checksum. Great. but now what ? So I then just have to paste it else where. Time saving. or even better What if I’d like to compare a given checksum for a given file I’ve downloaded for example ? do the same as above for the downloaded file then compare both the result and what is given ? Come on. I don’t mind to go to the Terminal, I actually go way more than I thought I would, but I’m lazy. If I have to do something more than once I’ll do all I can to automate it – I like to say. Maybe there is a built-in command to compare md5, I didn’t really searched for that, and it was a good way to practice coding again. So here it is some utilities to either compare a file and a checksum or simply create a Checkum. 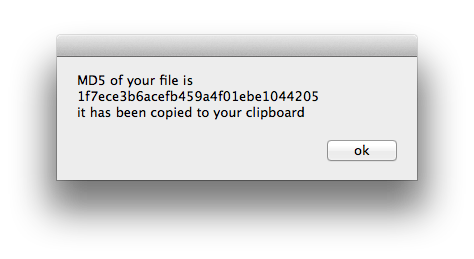 Simply drag a file on it. 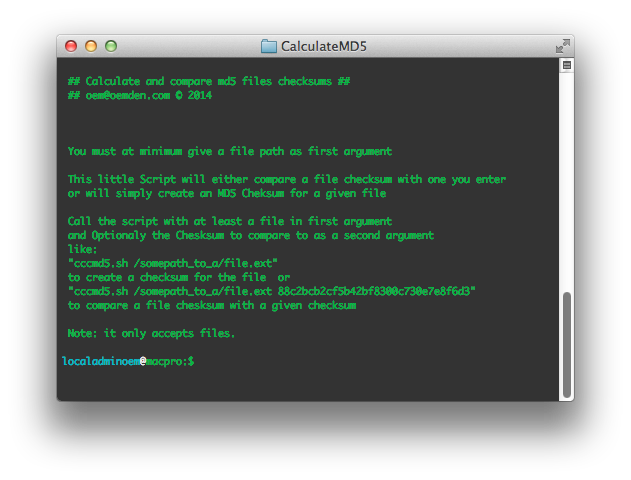 A small App to compare the file Checksum with a given Cheksum OR only create a checksum. A Shell script to put where you want it to be. You’ll then be prompted to enter the checksum of the file if you have it, it is optional and not mandatory. either the Checksums match or they don’t. If you did not entered a Chesksum then it will only create the Checksum for the file, show it to you and save it in your clipboard. Optionnaly you can add a checksum to compare as a second argument. If you have entered a Checksum it will compare what you entered and the file cheskum and give you the result. Either the Checksums match or they don’t. script invoqued with a file and a (wrong) checksum. 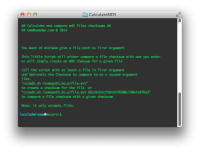 Add the possibility to have a txt file input as the second argument. Note : This is for OsX but the script itself should work on UNIX/LINUX as there is no special Mac commands here. 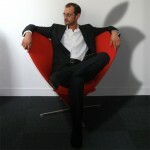 ‹ SFOTT | if your Mac thinks it’s a Macpro3,1 but it is not. 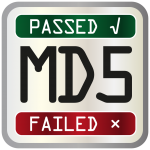 1 Pings/Trackbacks for "Calculate or compare MD5 Checksum(s)"